Hello! 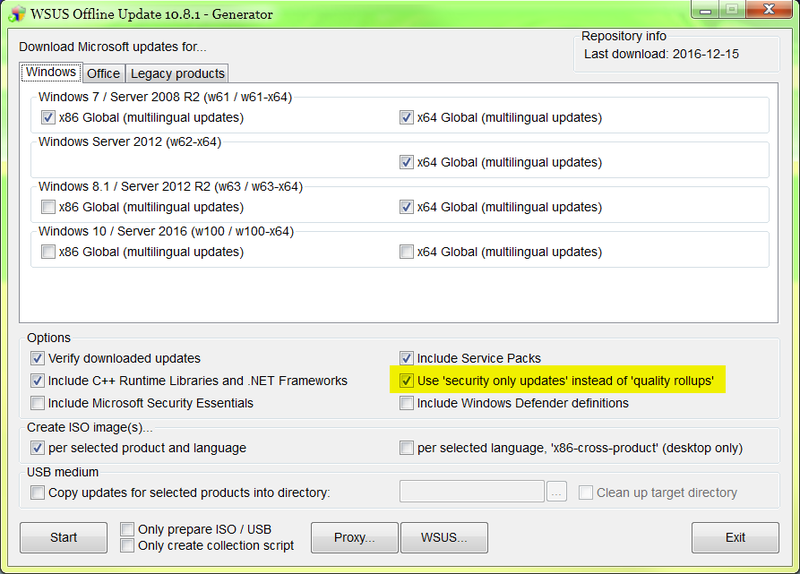 Should I install the KB3207752 update for Win7 x64 named "Security Monthly Quality Rollup" if I don't want telemetry? I think WSUSOU has blacklisted it, is that right? Because the update has been hidden since I last run WSUSOU. Is Microsoft still not releasing a security only update for December? All updates containing "Rollup" might contain telemetry stuff. WSUS Offline doesn't do blacklisting of those updates, you have to do it yourself by adding the updates to wsusoffline\exclude\custom\%win%-%arch%.txt (which is win61-x64.txt for Win7 x64). If you want to prevent the telemetry stuff, you should not install KB3207752 which is this month's Rollup, NOT the Security-Only update! And Microsoft has of course released a Security-Only update as they did in the last couple of months. For an overview, you can take a look at the Win7 update history page. The next version will have a simple switch for changing to Security-only. Braucht jemand den "/seconly"-Schalter noch vor Weihnachten? Dann werfe ich noch ein Build an, ansonsten: Schöne Weihnachten! Irgendwie funktioniert /seconly noch nicht so recht für dotNET (muß die Security-only .NET updates immer noch über Static installieren und die -seconly Listen patchen). Deshalb sollten wir es vielleicht noch in der Beta lassen. .NET ist ein einziges KB-Nummern-Chaos. Der Download hat tw. eine ganz andere KB# als der Artikel. Hab' ich aber angepasst in r843.